Thanks, JonSter- *Everything* from those countries? That makes one of us… not that I don't love quite a few of the wines from those parts, but I've tasted a fair amount of clunkers. Of course, you might just be the lucky person who has yet to run into one of those not-so-stellar bottles yet. Cheers! JonSter- totally agree with you. In my experience, Malbec prices for the stuff that used to be amazing bargains have moved up, for example, with lesser examples taking their price point places in the market. 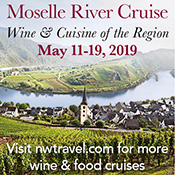 Portugal is offering amazing bargains right now, that is for sure, and Spain has really come on strong in the last 6+ years and showing no signs of slowing down yet (and there are some crazy good bargains available at the lower-end of the Rioja spectrum). Cheers! Casa Silva, Gran Reserva Petit Verdot 2006. Scrumptuous velvety cinnamon to balance the fruit acid, melts in your mouth! Jacira – Thanks. Interesting choice! Silva is a really cool place to visit, as well. I was led to believe the selection would be "random"! Jacira – oh, the winner selection is random, so opinions will not influence it :). I've been trying different Australian wines lately. Penfolds St. Henri Shiraz has been my favorite. The unknown, unappreciated white: Have not had a bad Argentinian Torrontes yet, and most are under $10. When Dungeness Crab season begins, here in Northern California, there's your go-to beverage! Sounds like a great book. I need to learn more about South Africa, and do more than dabble down-under. Much more familiar with the Southern Cone, and as such my small production favorite is Von Siebenthal Carabantes. First had it in VT, then had it in Santiago and it made even more sense. Have a few '04s still that are probably prime. Salud! Fav white is Oyster Bay Sauvignon Blanc. With a Torrentes from Argentina coming in second. Two of the most interesting wines I've ever tried were from South America. A family friend who had travelled throughout that continent in the 70s and 80s brought back some wines with him. About six years ago, he brought two wines from his trips to my Mum's place for dinner. The first was a Chilean Cabernet Sauvignon from 1978, and the other an Argentinian meritage blend from 1986. I cannot remember the producers of said wines because it not only happened years ago and I didn't write it down, but also because I didn't like wine at all and I hadn't had much experience with it since I hadn't reached legal drinking age yet. Despite that, I was poured a glass of each wine with dinner, anyway. To make a long story short, the first wines I ever liked in my life were these. So while there might be wines I absolutely love nowadays, I probably wouldn't have discovered them until much later in life, if ever, if I hadn't tried these two wines. Even my career can justifiably be traced back to trying them. So while they might not precisely be my favourite wines, they are the ones that made having a favourite be possible–sort of a meta-favourite. Also, these wines remain the oldest single-vintage wines I've tried, so far. MyrddinGwin- thanks for sharing that; I *love* hearing the formative wine stories that people have, the stuff that got them into wine. Cheers! I'm only just getting into Southern Hemisphere wines, so far my favorite has been Argentinian Malbec. I really want to try some South African wines! Thanks, Jon. Sounds like you've got a fun & tasty journey ahead there. Nothing beats the cheap and fun Bodega Colomé Torrontés on a warm day! Thanks,Rafael. Wow, lots of Torrontes luv so far in this giveaway! Thanks, Rhonda – finally, some Pinotage love! Hi Joe–thanks for posting! Wee can tell you how you received two copies: You were on our personal list of friends who write about wine, and you were also on the publisher's list of high profile wine bloggers. Thanks for the shout-out! 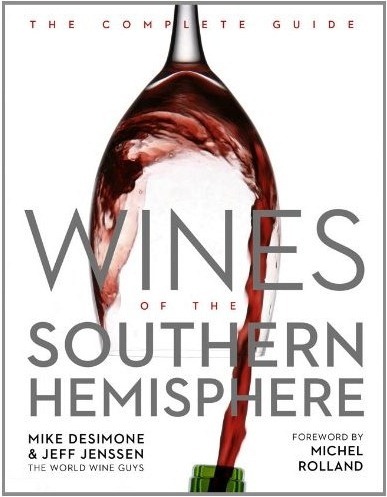 Unfortunately, I only got to explore wines of Italy with Mike and Jeff many years ago, before they became big shots :) So I really don't know much about any of the wines from the Southern Hemisphere : ( Does that make me a really good candidate for the book then? :) I mean really, who better to educate, right? ha ha ha. I feel like such a virgin. I really like John Duval's wines. I'll go with the 2005 Duval Plexus! Long been a fan of anything made by the folks at Turkey Flat in Barossa, especially their Butcher Block, which is a GSM blend of finesse and power. They make a wonderful extravagent shiraz as well. In general, the Pinot Noirs of the Adelaide Hills region of southern Australia. Underrated (and not well known about) Specifically, Ashton Hills Pinot Noir — truly an amazing Pinot. 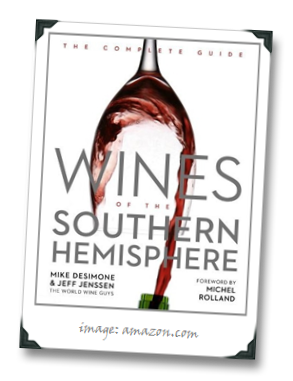 Pinots from this region are nearly impossible to find here in the US, especially here in the southeast, and the excellent, small lot productions rarely ever cross the border via distribution. Have to visit to taste them. Barossa Shiraz is always a good choice, but I really enjoyed the 2009 Clos de los Siete from Mendoza. Yum. I am also new to Southern Hemisphere wines, but here are a few I have tasted: 2010 Lancatay Malbec, 2010 Crios Malbec, 2011 Aresti Sauvignon Blanc, and 2011 Six Hats Chenin Blanc, Cheers! Thanks, Beth – the Crios wines in particular are pretty good value in my experience. Cheers! Being North of the 49th Parallel, I might even see a wider selection of Southern Hemisphere wines than I do American. I can give you faves from Mendoza (Pulenta), Chile (Errazuriz), NZ (Mount Riley) and any number from Barossa, McLaren Vale or Margaret River but a constant bottle in our home, for years, has been Langmeil's Valley Floor Shiraz from the Barossa. Cheers. Bob H. – Terrific pick, certainly one of the best producers in Barossa. Cheers! Just love 2009 Church Road Reserve Cabernet Merlot, from Hawkes Bay .NZ. Stunning with .NZ lamb. Henschke "Hill of Grace" with Penfolds Grange a very close 2nd. One of my absolute favorite wine/food experiences was at a restaurant in Cromwell, New Zealand. Quickly becoming a fan of Central Otago Pinot Noir (darn I wish they were easier to get on the Right Coast of the US! ), I was fortunate to select a saddleback of lamb paired with one of the local Pinot's. I would travel half way across the world again just to repeat that experience! Laura – nice, gotta love finding one you like for that price. Alright, folks – got our two randomly selected winners! They are JonSter and Masi3v. Thanks to everyone for the great comments and for sharing the recommendations!